Fine-tuning blog post categories continues with the splitting of “General LEGO” into three new categories, due to the three distinct types of posts there. You can now also see the category of the post before each title on the index grid. All Posts shows posts from all categories mixed together, in chronological order. Once you reach the end of a page, click “Older posts” at bottom right to see more posts. Click the large Quest for Bricks banner on top to return to the latest in All Posts. LEGO Building is a new category for non-era/non-quest specific LEGO building techniques, parts management and supporting activities. LEGO Fandom is a new category for adult fan of LEGO phenomenons, LEGO community topics and general musings about the LEGO hobby. LEGO Places is a new category for real-life LEGO places and events, such as LEGOLAND theme parks and LEGO stores. 1950-1960s LEGO is the first era-specific category. It got started when I rediscovered some of my father’s old LEGO. This covers the vintage years (1960s and earlier). 1970-1990s LEGO covers the so called classic LEGO, mostly focusing on the 1970s and 1980s, but also including 1990s if need be. 2000-2010s LEGO is a category for reviews and commentary concerning new, modern LEGO products and sets, such as the Lord of the Rings theme. 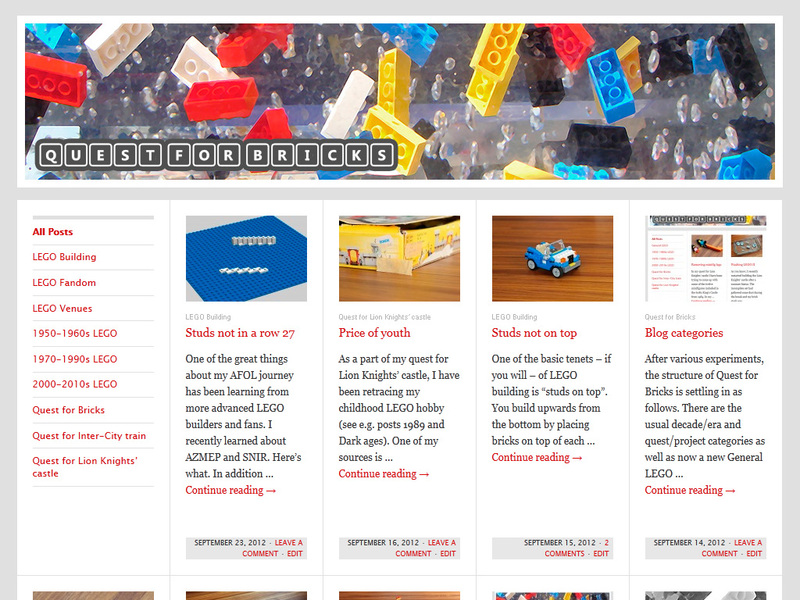 Quest for Bricks is a category for news and activities concerning this blog, such as this post. This keeps “housekeeping posts” from cluttering actual LEGO content. Quest for Inter-City train is my new project to build the 1980 LEGO Inter-City Train, again using both new brick purchases and spare parts from childhood sets. Quest for Lion Knights’ castle is my current project to build the 1984 LEGO King’s Castle, using parts from other childhood sets and new brickquisitions. You can select the category from the top left corner of the index page or from the bottom bar of all pages. Also, when viewing a blog post, the current category is now mentioned and linked to at the top right of the page. Update: LEGO Venues has been renamed to LEGO Places.